“And we call it…” were the words at the beginning of the smartphone revolution, which has transformed the ways we connect to Internet, read news and communicate with each other. The rise of the smartphone has occurred alongside the global adoption of LTE and TD-LTE for fast mobile broadband connectivity, which in turn has changed the way smartphones are used. A virtuous circle at work. These days, the fastest LTE-Advanced networks allow smartphone users to download data at over 350 Mbps. When the first commercial LTE networks were launched more than five years ago, the name “LTE” caused some irritation (“Come again, Long Term Evolution? And you say this is going to be the next big thing after Global System for Mobile Communications (GSM) and Universal Mobile Telecommunications System UMTS?”). In retrospect, I’d say the name has been chosen well: We are still in the early stages of the long evolution path of 4G. LTE has evolved to LTE-Advanced. And Network operators are successfully marketing LTE-Advanced based services as 4G+ and more recently 4G++. The LTE-Advanced enhancements, which are currently undergoing standardization in 3GPP in Release 13 and subsequent releases, mark a truly giant leap forward for 4G. The aggregation of up to 32 carriers made possible by LTE-Advanced, in combination with the use of unlicensed spectrum, will allow data rates to scale beyond 3 Gbps. Latency will shrink below 2 ms and spectral efficiency gains enabled by Full Dimensional MIMO will boost network capacity by a factor of 3. All these and further enhancements will not only benefit smartphone users, but also enable a host of new use cases, from connectivity for the Internet of Things to public safety. 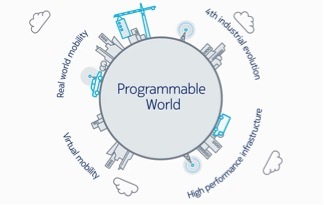 As usual, Nokia is well prepared to propel 4G into a new era of connectivity for consumers and professional users in a programmable world. New video: See LTE-Advanced Pro in action in this easy-to-follow animation: LTE Advanced Pro - The evolution of LTE Advanced towards the programmable world. New whitepaper: Read the nuts and bolts of LTE-Advanced Pro here in our newly published whitepaper. Please share your thoughts on this topic by replying below – and join the discussion with @nokianetworks on Twitter using #NetworksPerform #LTE #TDLTE.